Dante Lam’s That Demon Within, opening April 18th at Pacific Place, features several demons, actually. Of course, at least two of them are inside one person’s head. It’s a visceral, intriguing blend of gangsters, revenge, derangement, and lots of blood and guts. Only the frequently-stolen diamonds shine onscreen. Every face scowls and screams. Every orfice drains red. 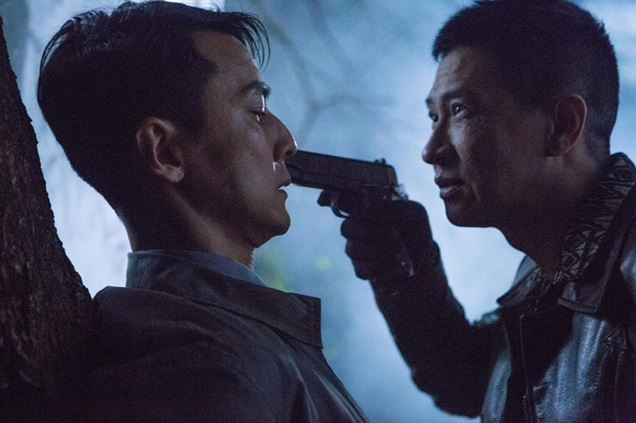 Daniel Wu stars as Dave Wong, a screwed-down tight beat cop. We know he is screwed-down tight because he talks to himself constantly, although as the film opens, he’s been able to keep the talking inside his head so far. His nemesis, Hon Kong [sic], played by Nick Cheung, actually was a Hong Kong cop for a few years, but here’s he’s mostly on the wrong side of the law, a cool cucumber who’ll grab anything to hand, to produce blood. So the bad man is chased by the good man, and the bad man wears a demon mask. As I mentioned before, though, everyone in this movie has demons. As Dave Wong goes along, he begins to sweat. And he begins to see things which may or may not be there. And these things begin to talk to him. And I won’t give away too much else, except that it all turns out to be about perfectionism, abasement, and remarkably bad parenting. Watch it! But bring an umbrella and your rubbers. (For your feet, silly).